Heat oven to 375°F (350°F for dark or nonstick pans). Place paper baking cup in each of 24 regular-size muffin cups. With 1 box of cake mix, make batter as directed on box, using water, oil and eggs. Divide batter evenly among muffin cups (about 2/3 full). Bake 20 to 25 minutes or until toothpick inserted in center comes out clean. Cool in pans 10 minutes; remove from pans to cooling racks. Cool completely, about 30 minutes. 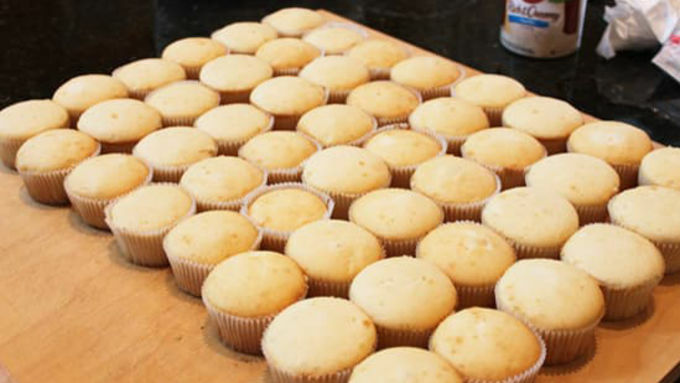 While 24 cupcakes are baking, make batter with remaining cake mix, water, oil and eggs. Repeat baking and cooling to make 24 more cupcakes. While cupcakes are cooling, tint 1 container frosting with blue food color; tint 1 1/2 containers frosting with red food color. Set both aside. Spoon remaining white frosting into decorating bag with large tip. 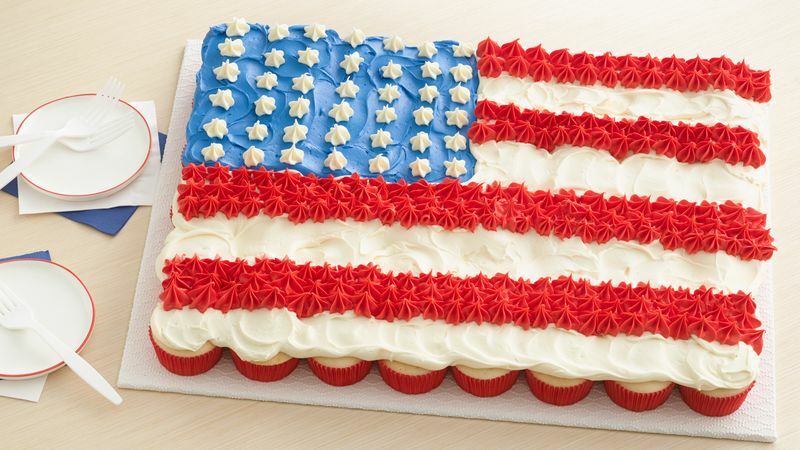 On covered board or cutting board, arrange cooled cupcakes into rectangle. Mark off 12 cupcakes to be frosted blue. 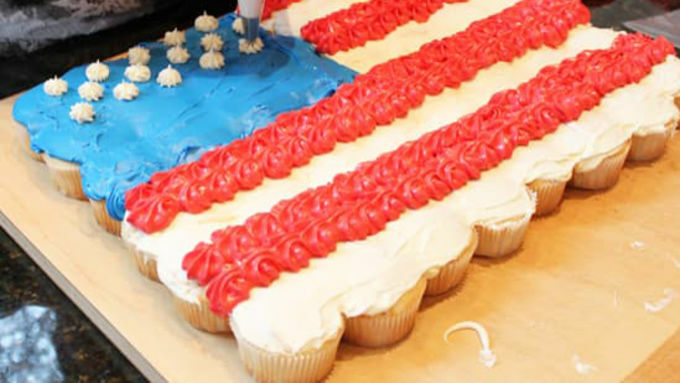 Pipe thick lines of white frosting onto remaining cupcakes; spread with spatula until smooth. 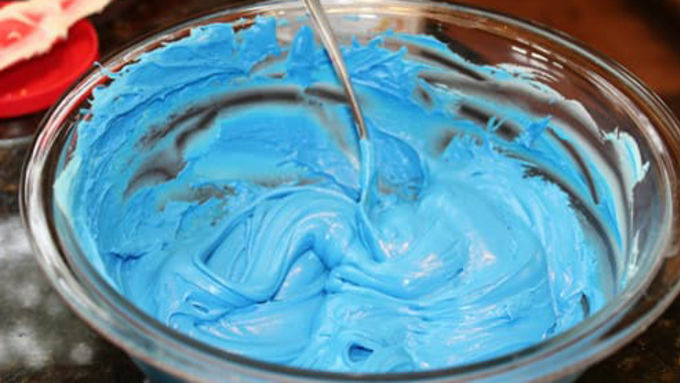 Spoon blue frosting into separate decorating bag; pipe onto the 12 cupcakes and smooth. 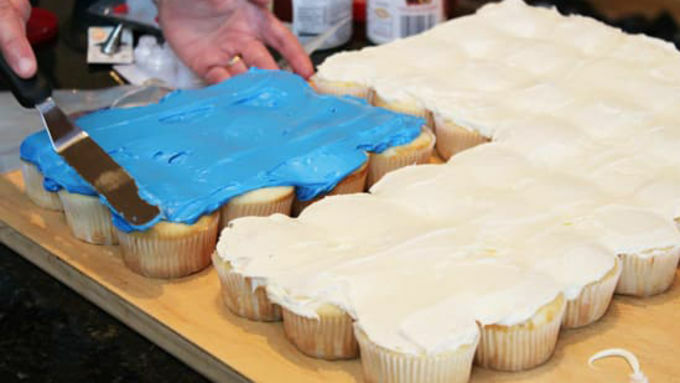 Carefully move blue section of cupcakes to join other portion of cupcakes. Into decorating bag with large star tip, spoon red frosting. Pipe stars in rows to make red stripes. Using smaller star tip, pipe white frosting stars onto blue frosting section. Freeze the cupcakes ahead of time so they are firmer to frost. Let frosting set just a bit between mixing in the color and spreading it on the cupcakes. It will become more stable and brighter in color.